Good Price Travel Lift Has Factory Price Good Quality! Travel Lift Manufacturer Provides Safe Driving Steady Travel Lift For Sale! Good price travel lift refers to travel lift with reliable quality and factory price. 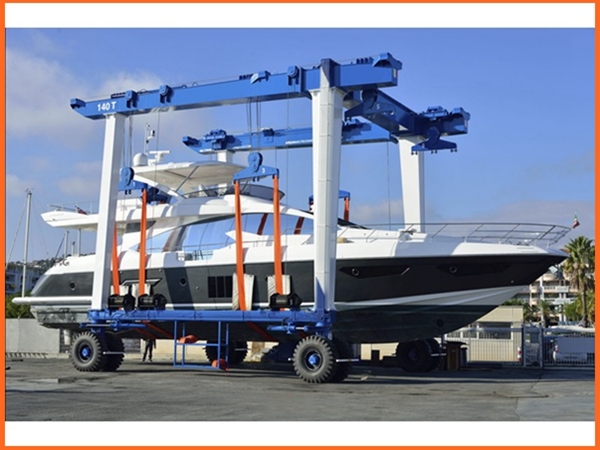 Cost-effective boat hoist is the most suitable choice for customers. The price is low, the quality is top. Customers can purchase great device with affordable cost! Ellsen, a famous and professional marine travel lift manufacturer in China, supplies marine travel lifts with steady performance and factory price. For loading capacity, it includes small boat travel lift, such as 10 ton travel lift, 35 ton marine travel lift for sale, 50 ton marine boat hoist, 60 ton travel lift for sale, 75 ton travel lift; heavy duty travel lift, such as 200 ton marine travel lift for sale, 500 ton mobile boat lift gantry crane, travel lift 800 ton, 1000 ton marine travel lift. For operation ways, it has remote control travel lift and cabin control travel lift. All these cranes have great performance and high efficiency. For any practical needs and requirement, Ellsen provides customized service for more suitable travel lift! 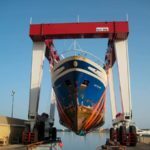 How to prolong service life of marine travel lift? Many factors influence the quality of marine travel lift, such as performance, material, safety device and daily maintenance. With steady performance, travel lift can move smoothly and fast. This can increase efficiency and improve working condition. Marine travel lift must adopt durable material, like anti-corrosion material and anti-water material. This can ensure long using term and reliable quality. Safety protection device is very important for travel lift. It can avoid accident, reduce failure rate and protect safety of machine and operator. Daily maintenance is also essential for boat hoist. Careful maintenance before and after operation, can find problems early and solve them timely. This can reduce much damage for marine travel lift. 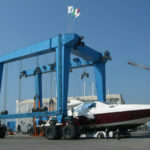 Ellsen marine travel lift has compact structure. The main parts include frame structure, traveling wheel block, hoisting mechanism, steering mechanism, hydraulic transmission system, electric control system, the main structure for the “U” type. Travel lift gantry crane belongs to a kind of heavy duty lifting machine. If the structure is complicated, then it takes much energy and time for the operator to carry daily check work. Simple design can make check work easy and operation safe. For travel lift parts, Ellsen provides customized service. 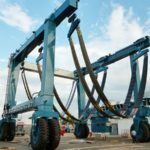 The following parts are available to purchase, lifting slings, wire rope, sheave pulleys, mounting pins, tires, tubes, flaps, chains, sprockets, bearings, winch brake parts, hydraulic tubing, hoses, filters, cylinders, hydraulic pumps and drive motors. Ellsen pays attention to every details and parts of marine travel lift, so that customers can get the most satisfied crane. Boat hoist slings are used for raising boats and ships out of the water for maintenance and transfer over land. These marine slings are made with a special lifting sling application, and require one or many specific features, including: chine pads, disconnects, sliding wear pads, sewn in weights, or additional sewn eyes for adjustment. These boat slings, also called travel lift slings, come in many different sizes and with many options. 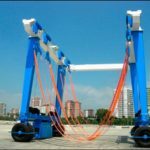 For further information on boat hoist slings, please read on below. Nylon sling or polyester sling? Boat slings can be made in nylon webbing or polyester webbing. The keel pad can be made with, or without, lead weights sewn in and is padded to protect damage to the keel. The lead weights help weigh the sling down in the water so the boat sling stays under boat/ship easier. The hoist slings are typically disconnected with sewn fingers and a special pin that is used to keep the sling together. The disconnect is usually off center to avoid contact with the keel. The disconnect of the webbing sling can also have an additional protective flap sewn in to protect the surface of the boat from abrasion damage. Ellsen provides the strongest marine travel lift tires on the market! Ellsen travel lift tires have a maximum loading capacity of 30 tonnes per tire. 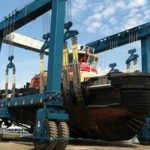 The tires are excellent for boat lifts, travel lifts and marine boat lifts. Rubber tires have multiple advantages, they can carry far more weight and have a greater elasticity and better traction. The tires stable performances result in more removable flexibility. Ellsen provides customized service, and customers can order boat lift tires in different sizes. As an important part of marine travel lift, the tires are related to the crane safety and service term. Durable and strong tires can ensure the crane stable move, flexible travel and reliable performance. How to ensure the tires high quality? First is to choose a professional travel lift supplier. Responsible suppliers always put the quality and customers on the first place. Second is to operate the crane properly according to operating principle, such as never over-load or over-speed. This can decrease the damage and abrasion of crane tires. Third, take daily check work for the tires and other parts. This can help find problems earlier and avoid damage. 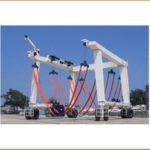 Marine boat lift crane travels through flexible wheels, and lifts the vessel through strong belts. For the operation ways, the customers can choose following types, cabin control, remote control or cabin control + remote control. The electric motor can produce driving force. 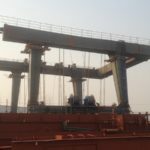 For the crane traveling, it can move in diagonal direction, it can also steer in 90 degree and put the vessel in any designed position according to requirements. It can adjust the width of the main girder according to the boat in case to handling different size boats. This crane owns the performance of low cost, great performance, easy operation and simple maintenance. It can make the boat in order quickly, and adjust the gap between each boat according to different conditions. When choose travel lift remote control crane? 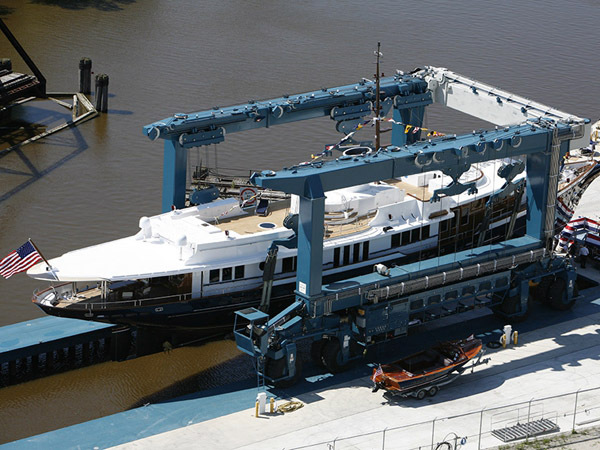 When the vessels you need to move approach 150 to 1200 tons and greater, you need a mobile boat hoist that’s been engineered to handle the load. That’s the strong point of Ellsen travel lift series. Ellsen heavy duty haulers meet or exceed every standard that is applied for the safest, most economical transportation for customers’ yachts or work boats. With Ellsen brand name, you can be sure that Ellsen is professional in travel lift design, manufacturing or assembly.